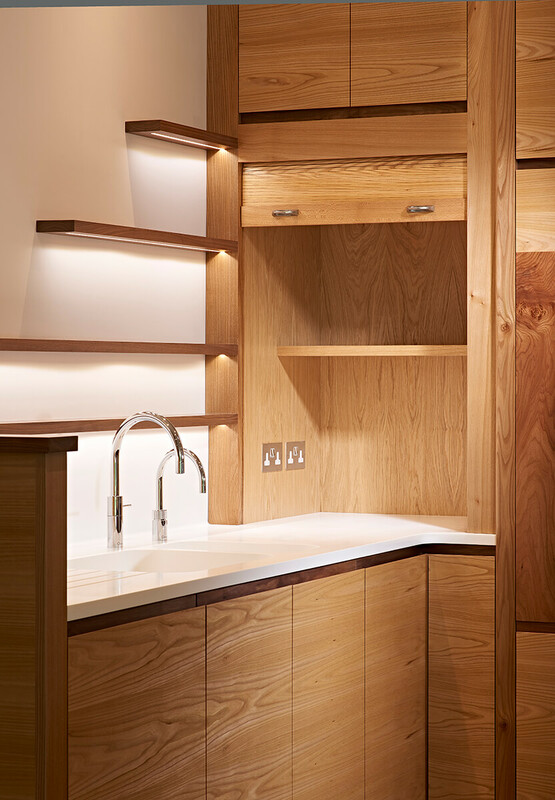 We have made a lot recently of our collaborations with architects and interior designers but this project in Surrey took us right back to our roots, working directly with the client to produce a truly bespoke kitchen meeting their individual needs. The initial contact was made during a 6am email exchange on a Saturday morning (we were both clearly morning people) and was followed by a face to face meeting later the same day back in November 2015. This was the start of one of those special client and designer relationships where personalities just seem to ‘click’. They had approached us a few months before building had started on their project to build a new home on their existing plot in Surrey. This was the perfect time frame for us to get involved, just after the main contractor had been appointed and the build plans had been finalised. A key feature was a huge family room across the back of the house to incorporate sitting and dining areas and, of course, the kitchen. The whole of the wall overlooking their substantial garden was to be glass, as was an internal wall bringing natural light into the centre of the building. This was to be the room that the family would spend most of their time in and they had spent a significant amount of time researching kitchen designers which had helped them to clarify precisely what they wanted. 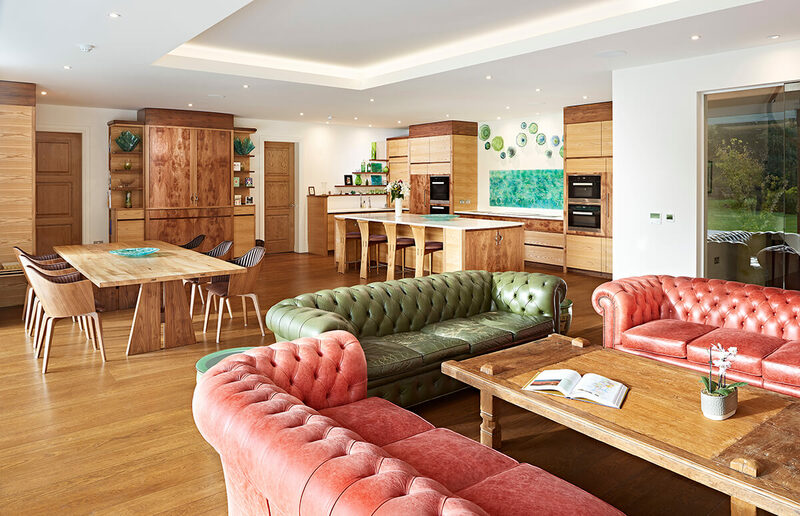 However, all the designs they had been presented with had a similar ‘cookie-cut’ feel and they were after an altogether more bespoke kitchen, unique to them. Images on our website and that early morning email exchange helped to convince them that Simon had the passion and the vision to deliver what they wanted. By the time we got involved then, the clients had a very clear idea of what they wanted. Simon helped to refine the design, listening carefully to their requirements, making suggestions and adding a number of details. 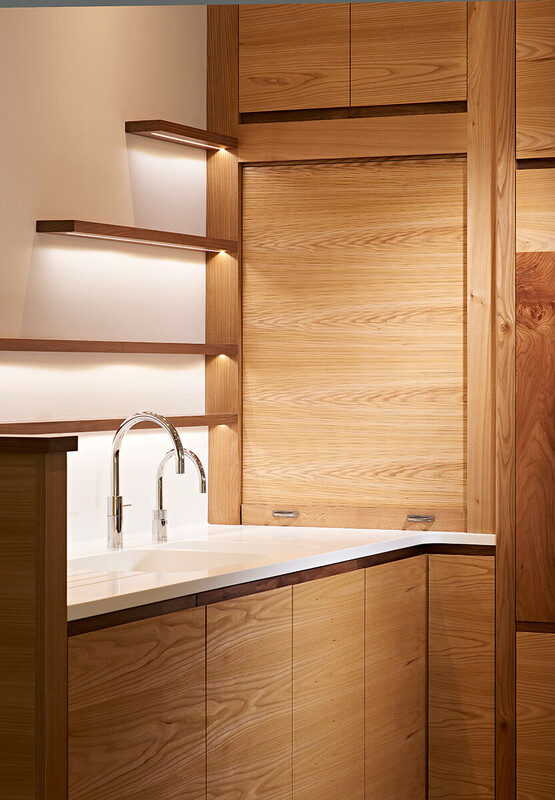 This large and very light space required some careful selection of timber, too light and the cabinetry would look bleached out; too dark and the contrast would be too great. 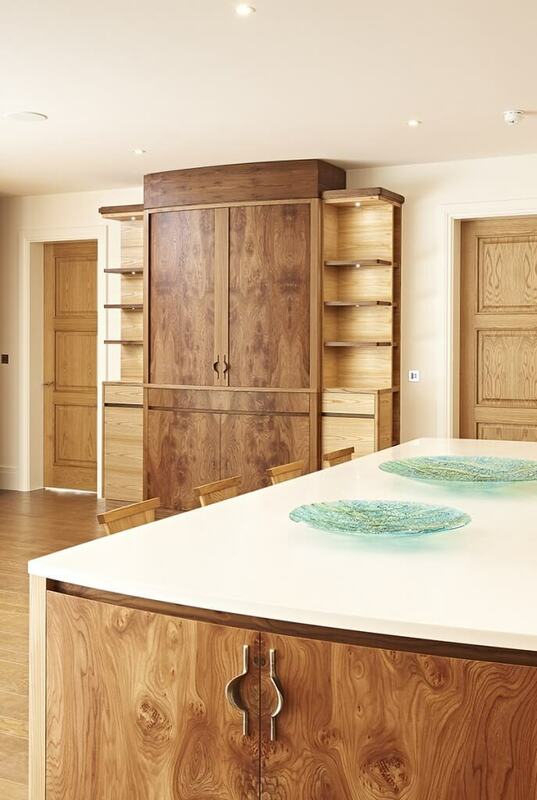 The conclusion was to go for cabinets made principally from elm with black walnut details and with stunning burr elm highlights on the key feature doors and drawer fronts. As the client explains, “Simon’s greatest value was in putting the materials and woods together and in sourcing the timber.” This intense pallet of timbers is counteracted by the choice of very stark white Corian work surfaces and the rich intensity of Jo Downs’ handcrafted, sea-green glass which together create an atmosphere of fresh calm. The long back wall houses all of the key kitchen appliances. 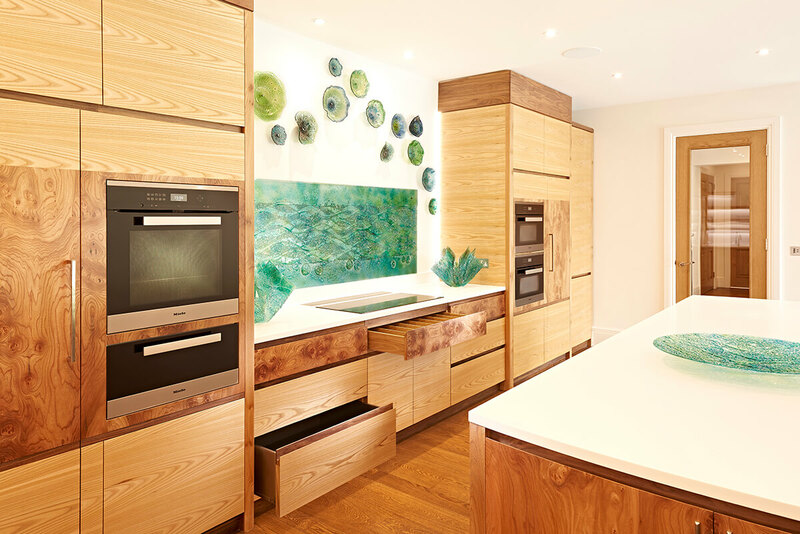 The tall elm cabinets contain Miele main oven, warming drawer, steam oven and microwave combination oven. Behind burr elm doors are the integrated Liebherr fridge and freezer and the lower section houses the Miele induction hob. In order to protect the simplicity of the back wall and to leave it free for the beautiful, green glass splash-back and decorative wall plates, we fitted a Westin downdraft extractor. Having the central hob unit flanked on either side by the ovens, fridge and freezer creates a pleasing symmetry and creates an almost stage-like appearance. To the left of this cooking ‘stage’ the sink is at a right-angle to the rest of the kitchen. It is fitted with Quooker Nordic round twin tap which provides instant boiling water and negates the need for a kettle. Next to the sink, a horizontal tambour door, disguises the smaller appliances such as toaster or food mixer which the client uses regularly but did not wish to have on permanent display. The largest feature of the kitchen is the large rectangular island. Unusually for one of our kitchens, there are no appliances or water services in this island. It incorporates a range of elm cabinets and drawers down one side and seats four, on our ‘Guinness and Murphy’ stools, along the other side. 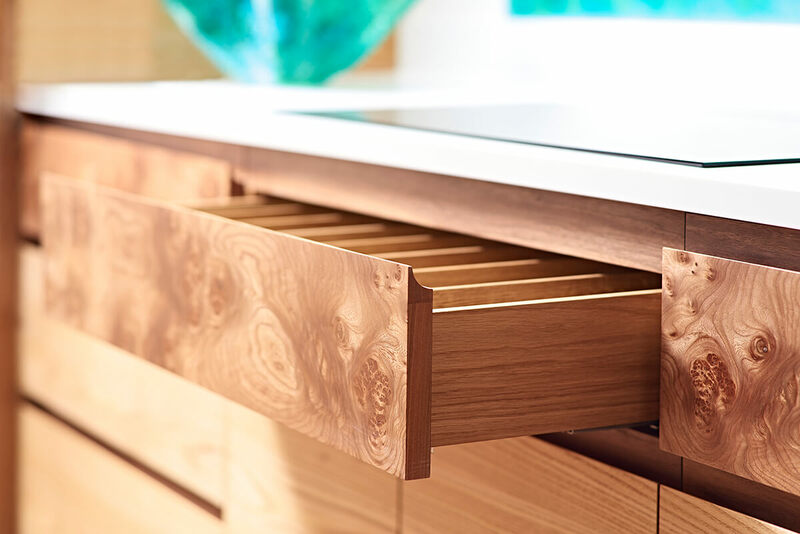 There are also storage cabinets at either end and these are very subtly curved to provide a sense of movement and flow through the kitchen space. The gentle curves of the island are echoed in the front of the more decorative breakfast cabinet which features large, curved, vertical tambour doors and contrasts with the simplicity of the island. 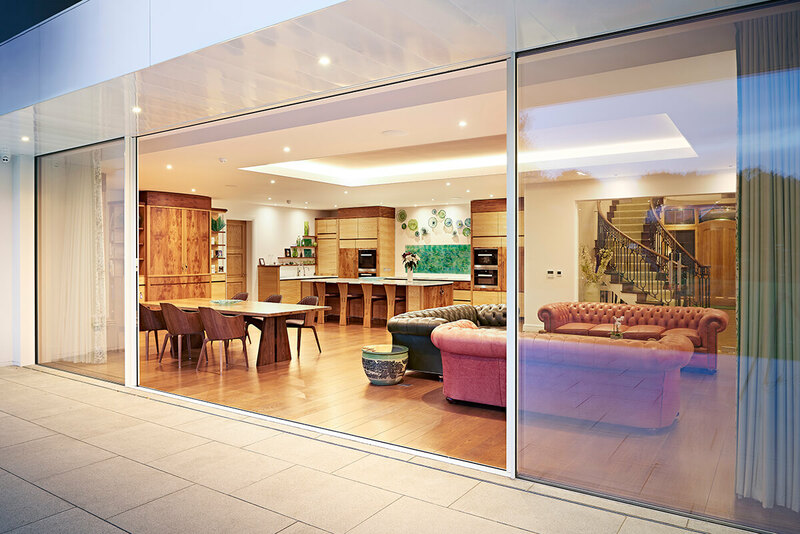 The doors are constructed of intricate, burr elm slats which slide open to reveal a lit ripple sycamore interior that the client particularly loves because it “looks like a sheet of silk”. On either side of the tambour cabinet, there are display shelves and tucked behind these are side slivers of shelving ideal for storing cookery books. Another large elm cabinet with walnut details houses the Liebherr wine fridge. This is conveniently positioned so as to be easily accessed during dinner at the 12 seat dining table which features a glorious, hand-selected Wych elm top supported on a walnut under-frame. The Wych elm has a delicate green sheen which works exceptionally well with the green glass, chosen by the client for its suggestion of the movement and colour of the sea.